Whether you're far away from Grandma's house or just don't want to cook, having Thanksgiving dinner at a restaurant might sound very appealing. Here are some great choices for Thanksgiving dinner in the Salt Lake City area in 2018, with both fine dining and less expensive options. Reservations are always required for dinner on Thanksgiving Day. Buca di Beppo will open at 11 a.m. on Thanksgiving and serve a traditional Thanksgiving dinner, or you can order off the regular Italian menu. If you really want Buca di Beppo's food but you would rather eat at home, you can also get it to go or they will cater a Thanksgiving dinner for you. Homestead Resort in Heber will be serving a Thanksgiving grand buffet including roast turkey and prime rib, plus salads, sides, bread and cheese boards, shellfish, and desserts. The resort offers cross-country skiing, sleigh rides, ice skating, downhill ski packages, a spa, hot springs, and other activities. Make it a fun holiday weekend getaway. The buffet is $49.95 for adults and $32.95 for children. La Caille is serving Thanksgiving dinner from noon to 6 p.m. in its spectacular French chateau setting. It's a three-course prix-fixe menu featuring red pear salad; pumpkin soup; your choice of free-range turkey, glazed king salmon, prime rib, or honey-glazed ham, all with sides; and apple pecan bread pudding and white chocolate cranberry pavlova for dessert. 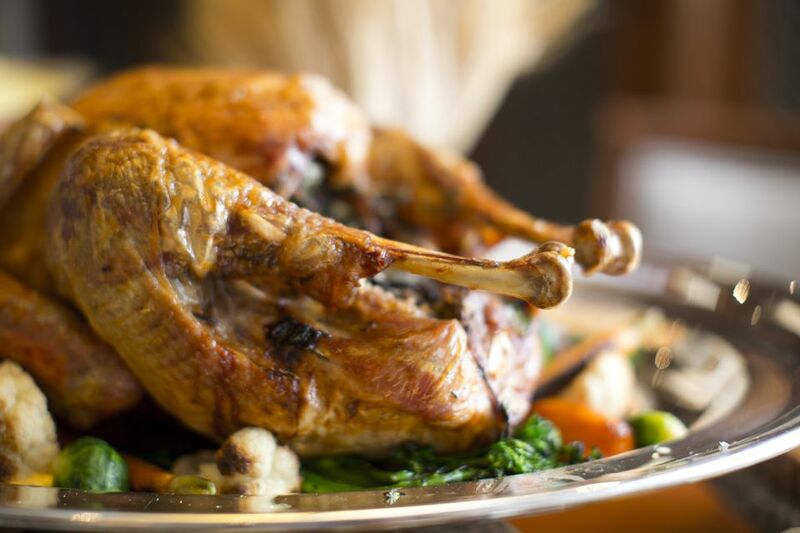 La Caille includes all your Thanksgiving favorites in a spectacular French chateau setting. It is $73 for adults and $36 for kids. Log Haven restaurant in Millcreek Canyon is serving up a Thanksgiving Day four-course prix-fixe luncheon from 1 to 5:30 p.m. Its unusual menu offers ricotta and butternut squash panetta, potato leek soup, wild mushroom ragu with Parmesan grits, baby winter greens, juniper-brined turkey, grilled king salmon, pan-roasted filet, or butternut squash risotto, and dessert of creme brulee, pumpkin cheesecake, or pumpkin pie. This sumptuous meal is $54.95 for adults and $29.95 for children. If you haven't experienced the incredible service, ambiance, and cuisine of Stein Eriksen Lodge in Deer Valley, a Thanksgiving buffet might be a good time to give it a try. The Glitretind Restaurant offers Forbes four-star dining and would make for a memorable Thanksgiving Day brunch. Prices and times were not available as of this writing. Head on over to the Hub & Spoke Diner for Thanksgiving Day brunch. Served from 10 a.m. to 2 p.m., this is a slightly different take on the biggest feast day of the year. You can order a la carte off a special Thanksgiving Day menu. For an offbeat Thanksgiving dinner, check out Flanagan's on Main in Park City, voted the best Irish pub in Utah year after year. At Flanagan's you'll be served a three-course prix-fixe Thanksgiving feast of butternut squash soup, roasted turkey with giblet gravy, stuffing, cranberries, candied yams, and green beans almondine. And for dessert you won't be able to resist pumpkin pie with ice cream. You'll get this traditional spread in a cozy setting for $24.95 per person.